Designing, financing, and operating successful solar heating, concentrating solar power, and photovoltaic systems requires reliable information about the solar resource available and its variability over time. In the past, seasonal and daily variability has been studied and understood; however, with new solar technologies becoming more important in energy supply grids, small time-scale effects are critical to successful deployment of these important low carbon technologies. A vital part of the bankability of solar projects is to understand the variability of the solar resource so that supply and storage technologies can be optimized. Bankable data for solar energy projects needs to ensure as much as possible the accuracy and general quality of solar radiation data to be used in the solar resource assessment studies for any site of interest in a project development. The term “site adaptation” is being used in the framework of solar energy projects to refer to the improvement that can be achieved in satellite-derived (or more generally model-derived) solar irradiance when short-term local ground measurements are used to correct systematic errors and bias of the original dataset. This document presents a review of different techniques for correcting long-term satellite-derived solar radiation data by using short-term ground measurements. The collaborative work has been done within the framework of Task 46 “Solar Resource Assessment and Forecasting” of the International Energy Agency’s Solar Heating and Cooling Programme. Different approaches whose use depends on the origin and characteristics of the uncertainties of the modelled data are presented. 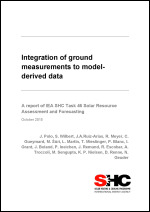 Recommendations to the use of ground measurements and the results of several approaches to improve satellite-derived data are shown through this report highlighting the importance of using site adaptation and the different degree of improvement that can be achieved depending on the climatological characteristics of the site. Large-scale solar thermal projects, such as those producing industrial process heat for mining areas in Chile or district heating in Denmark, require diligent solar resource assessments. Unfortunately, high accuracy irradiance data are scarcely available in many regions that are attractive for solar energy applications. This holds especially true for solar thermal technologies using concentrating collectors to produce high temperatures. For these systems, the focus of the resource assessment is on direct normal, or beam irradiance (DNI). Satellite data can only be used in combination with ground data to estimate inter-annual variability and long-term mean values. Hence, new ground measurements have to be collected for projects using concentrating collectors, such as high temperature process heat or district heating systems. Ground measurement data usually show significantly higher accuracies than satellite derived irradiance data, when general guidelines regarding site selection and preparation, instrument selection and maintenance and data quality monitoring are respected. 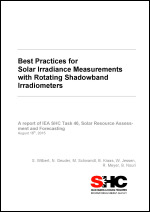 Best practices for Rotating Shadowband Irradiometers (RSIs), developed within the framework of IEA SHC Task 46: Solar Resource Assessment and Forecasting, are presented in this report. 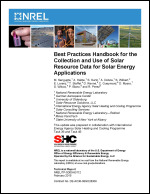 The first version of this handbook was developed in response to a growing need by the solar energy industry for a single document addressing the key aspects of solar resource characterization. The solar energy industry has developed rapidly throughout the last few years, and there have been significant enhancements in the body of knowledge in the areas of solar resource assessment and forecasting. Thus, this second version of the handbook was developed from the need to update and enhance the initial version and present the state of the art in a condensed form for all of its users. 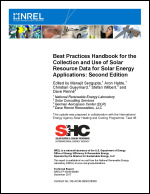 Although the first version of this handbook was developed by only researchers from the National Renewable Energy Laboratory, this version has additional contributions from an international group of experts primarily from the knowledge that has been gained through participation in the International Energy Agency’s Solar Heating and Cooling Programme Task 36 and Task 46. As in the first version, this material was assembled by scientists and engineers who have many decades of combined experience in atmospheric science, radiometry, meteorological data processing, and renewable energy technology development. Readers are encouraged to provide feedback to the authors for future revisions and an expansion of the handbook’s scope and content.